Lalo Schifrin is one of the most distinguished composers of the Silver Age—and still going strong today. He may have been the most influential, however, when he broke into movies and television in the 1960s—his unique synthesis of jazz, symphonic, pop and avant garde styles was invigorating. For the first time, FSM presents an extended collection of Schifrin’s 1960s theatrical film scores, comprised of a quintet of M-G-M original soundtracks and related album recordings. Rhino! 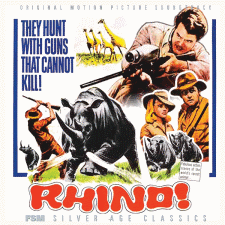 (1964) was Schifrin’s first Hollywood score, written for an African safari adventure starring Robert Culp, Harry Guardino and Shirley Eaton. Schifrin was recommended by MGM Records (where he was a recording artist) as being the film studio’s answer for Henry Mancini on Hatari!—a tall order, but one Schifrin pulled off with a vibrant and exciting symphonic score, featuring exotic African instrumentation and several memorable themes and musical setpieces. Once a Thief (1965), Schifrin’s second feature score at M-G-M, is a corker of a jazz soundtrack for Ralph Nelson’s film noir starring Alain Delon, Jack Palance and Ann-Margret. Schifrin’s score, at turns dynamic and poetic, was heralded by jazz critics as one of the rare, authentic uses of the idiom in a Hollywood movie. The album includes both the original soundtrack (never before released) and Schifrin’s 1965 LP for Verve Records, Once a Thief and Other Themes (also including selections from The Man From U.N.C.L.E. and Joy House, and a few non-soundtrack pieces). Disc three features what is probably Schifrin’s best-known score for M-G-M, The Cincinnati Kid (1965), the Norman Jewison film starring Steve McQueen as an up-and-coming gambler in 1930s New Orleans. Schifrin wrote a bluesy score centering on a theme for harmonica, sung (with lyrics by Dorcas Cochran) over the end titles by Ray Charles. The album features both the MGM Records album (a hybrid of original soundtrack and re-recorded selections) and the complete original soundtrack as recorded for the film, including many alternates and unused cues. 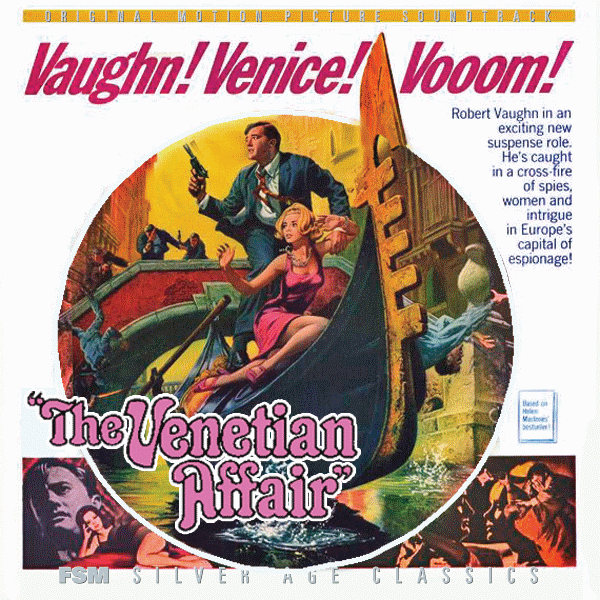 Discs four and five feature two late-1960s films in which M-G-M tried to build feature careers for the stars from The Man From U.N.C.L.E., Robert Vaughn (in 1967’s The Venetian Affair) and David McCallum (in 1968’s Sol Madrid), by casting them (separately) in unrelated stories of international espionage. 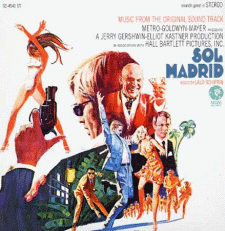 Schifrin’s scores to both films are excellent: pulsating, moody Cold War intrigue for The Venetian Affair (featuring cymbalom), and diverse, often Latin-flavored pop and jazz for Sol Madrid (alongside more traditional scoring). Disc five concludes with an assortment of bonus tracks from Schifrin’s M-G-M work of the period, including themes from TV projects Medical Center, The Mask of Sheba and Earth II. The entire 5CD set, save for a few tracks, is in excellent stereo sound, remastered from the original 35mm three-track scoring masters (for the original soundtracks) or ¼” two-track album masters (for the record albums). Liner notes are by Schifrin authority Jon Burlingame. As an additional bonus, full track-by-track commentary can be found, for free, online at our website. 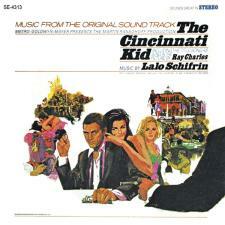 NOW AVAILABLE: THE CINCINNATI KID AND OTHER M-G-M LALO SCHIFRIN SCORES IN A FIVE CD SET! Film Score Monthly presents Vol. 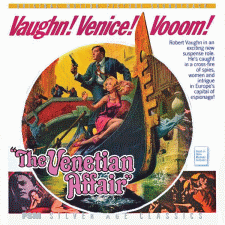 1 (1964-1968) with scores to RHINO, ONCE A THIEF, THE VENETIAN AFFAIR, SOL MADRID and more. This is quite awesome. I'm a big Schifrin fan and can't wait to listen to it! early 80's scores (Black Moon Rising + one of my grails Terror At London Bridge). Maybe in Volume 2 or 3? Wow, a vocal by Julius LaRosa! The man who got zotzed by Arthur Godfrey on the air! Actually, this set seems to be JUST the thing for ANYONE who is interested in the popular jazz idioms particular to the 60's. Thanks to all involved in realising this fantastic set - ordered in a heartbeat. I'm thrilled by the inclusion of the TV stuff as a little bonus. The siren of the Medical Center theme is burned into my brain. 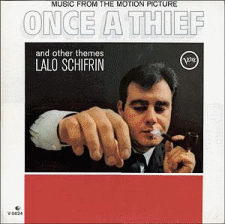 I'm trying not to buy any Cds for two months but have failed again with the announcement of this Lalo Schifrin set. Just had to have this. Anyway, no more CD purchases until May 11, I hope. John W. "Jack" Cave, Vincent N. DeRosa, Arthur Frantz, William A. Hinshaw, Herman Lebow, Arthur Maebe, Jr.